After earning his Ph.D. in chemical engineering from Princeton in 1966, Tom joined the CIA in Washington, DC, and in his spare time found himself singing more than playing, both in a church choir and a barbershop chorus and quartet. But in 1976, the Bicentennial Year, he responded to an ad calling for band players to audition to play in a band sponsored by the Washington Post newspaper, especially created to help celebrate the Bicentennial. A month or so later he found himself marching down Constitution Avenue on July 4th, 1976 playing (no surprise here) The Washington Post march! The Post's band dissolved at the end of that summer, but Tom was determined to keep playing; so in the years following, he joined the Vienna (VA) Community Band, the Reston (VA) Chamber Orchestra, and the newly created Difficult Run Jazz Band. He played in these three groups until moving to Colorado Springs in 1999 to become the CIA's Officer in Residence at the Air Force Academy, where he co-founded and still plays in the Academy's Dean’s Brass Ensemble. After retiring from the CIA in 2001, ending a 35-year career, Tom and his wife Amy Plapp and their daughter Stephanie decided to remain in the Springs, and shortly afterward, Tom joined the Little London Winds. 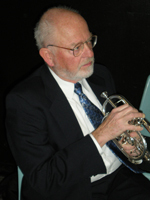 More recently, Tom joined the Round Town brass quintet playing French horn and became conductor of a double quintet, the Front Range Brass. Aaron Copland. Copland wrote very bold music with catchy rhythms and powerful brass. He was contemplative as well, as in “Quiet City”, which features trumpet and English horn and which I had the honor of playing with the Reston Chamber Orchestra. If silence is golden, what is noise? Noise is sound with no structure, but noise and silence do not form a complete set. In between is sound with varying amounts of structure, some more pleasing than others. Perhaps the noblest of structured sound is music. If all the world’s a stage, then where does the audience sit? On another part of the stage that happens to have seats on it.